We offer 3 easy ways to place an order with Selections from Museums of Canada. We are glad you have found our site! Click on a link below for more FAQs about placing an order. A gift certificate from is the perfect choice when you are out of time or don't know what to give. Online gift certificates are sent by email, and your recipient will be thrilled to be able to start shopping immediately. Expiry: Gift certificates expire 12 months from the date of purchase. Delivery: Electronic gift certificates are sent by e-mail when the order is processed and may only be redeemed online at museumsofcanada.com. How do I use or redeem a Gift Certificate? Electronic gift certificates are sent by e-mail when the order is processed and may only be redeemed by calling the toll-free number 1-800-221-4443. To place an order for countries other than the US and Canada, please contact our Customer Service Team by phone. How do I pay for my order if I'm mailing it? On the order form, there is an option for paying by credit card. If this is your preference, simply complete the information and we will process the payment when we receive the order. If you prefer to pay by cheque, please include a cheque for the total order amount. If you have any questions about your total, please contact our Customer Service team. IMPORTANT: Please do not send cash in the mail. And, we're sorry, but we do not ship C.O.D. Yes! 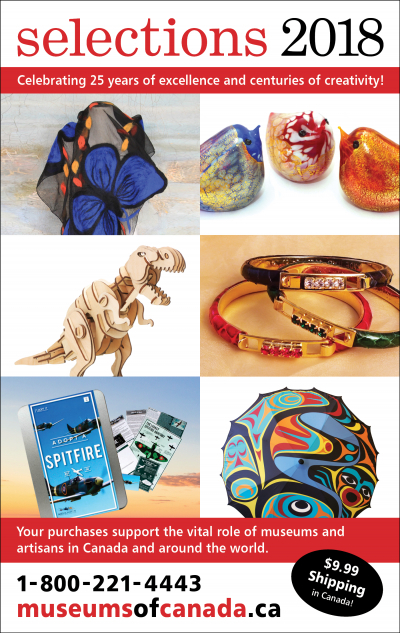 We like to make it easy to give a gift from Selections from Museums of Canada. For $6 per item, we will wrap your item and include a gift tag with a personalized message. Online Orders: Please select the Gift Wrapping Option on the product page. Then, when you check out, please use the Message Field to provide the note you want included on the card. Orders by Mail: Please complete the information on the Order Form, as indicated. I have an online Promotion Code. How do I use it? When you check out, there will be a field where you can enter your Promotion Code. IMPORTANT: Promotional offers apply only to new online orders placed within the time frame of the promotion. An offer is based on the merchandise subtotal per each shipping address. An offer cannot be applied to a previous purchase and cannot be combined with any other offers. We accept MasterCard, VISA, and cheques or money orders made payable to Selections from Museums of Canada.